187 The W.C.T.U. met in the parlor of the Congregational Church Sept. 21st with Mrs. Robt. Lincoln presiding. The devotionals were led by Mrs. M.E. Hess. The treasurer's report ending the year of 1926 was given by Mrs. John C. Lincoln and accepted. There was a balance on hand in the treasury of $70.50. The secretary's report was read and accepted. A tribute was offered the late Miss Harriett Buck. Mrs. John C. Lincoln was chosen to act as treasurer in her place. It was moved and seconded that the ladies named to act as directors of the following departments Scientific Temperance Instruction; Mrs. Mary Gorsuch Anti-Narcotics; Miss Jennie Baily Sabbath Observance; Mrs. Emma Baily Child Welfare; Mrs. Ebbie Stocks Evangelistic and Systematic Giving, Mrs. C. Wood. Flower Missions and Relief; Mrs. M.E.Hess Press and Publicity; Miss Delma Anger Benedict Home; Mrs. L.C. Stoaks Literature; Mrs. G.W. Watland Peace, Mrs. H.S. 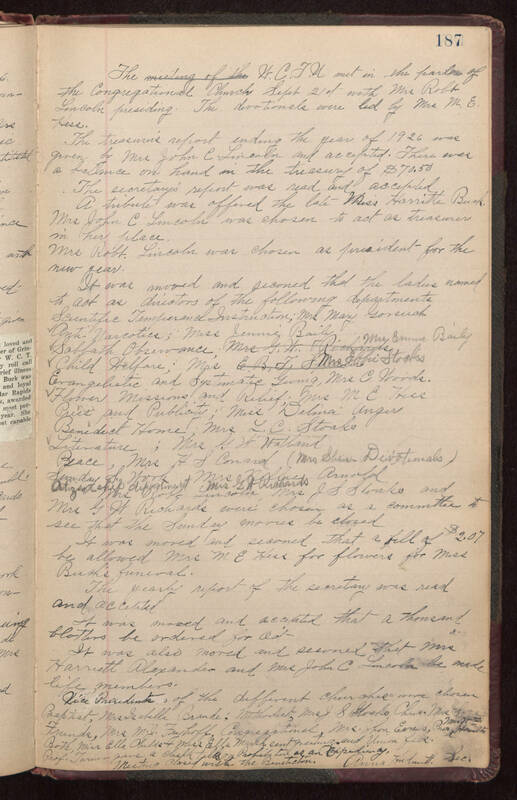 Conard (Mrs. Shaw - Devotionals) Sunday S. Work; Mrs. Nellie Arnold Citizenship department. Mrs. Robt Lincoln, Mrs. J.W. Richards, Mrs. J.S. Soaks and Mrs. G.W. Richards were chosen as a committee to see that the Sunday movies be closed. It was moved and secon[d]ed that a bill of $2.07 be allowed Mrs. M.E. Hell for flowers for Miss Buck's funeral. The yearly report of the secretary was read and accepted. It was moved and accepted that a thousand blotters be ordered for Oct. It was also moved and seconded that Mrs. Harriett Alexander and Mrs. John C. Lincoln be made life members. Vice Presidents of the different churches were chosen Baptist, Mrs. Isabella Brande, Methodist Mrs. J.S. Stoaks, Chris. Mrs. S[illegible] Friends, Mrs. M.J. Freihoff, Congregational, Mrs. John Evans, Pres., Mrs. Wm. Hamilton [Both? ], Miss Ella Childs & Miss Ella Marsh sent greetings and Union fees. Prof. Turner gave a chalk talk on Prohibition as an Expediency. Meeting closed with the Benediction. Anna Hudnutt, Sec.